“I’ve never heard one judge in that room say something really mean, even in a joking way, about another. It doesn’t happen. 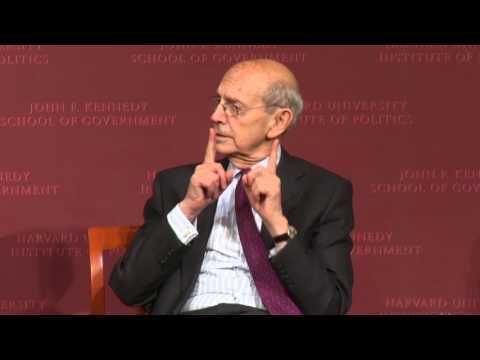 It’s professional,” Associate Supreme Court Justice Stephen Breyer told students during a talk at Harvard Kennedy School. From the outside, it can look like life on the U.S. Supreme Court is little more than a succession of sour exchanges between ideological gladiators, a grind that’s more intellectual food fight than dispassionate debate. But for all of the tough talk and purple prose that can find its way into the court’s most closely watched 5-4 decisions, Associate Justice Stephen Breyer, LL.B ’64, says don’t mistake the rhetoric of political disagreement with personal animosity. This is not an angry bunch who can’t see straight enough to understand the arguments on both sides of an issue. Where court observers like to point to the dramatic, felicitous language of a Justice Antonin Scalia opinion, for example, as proof of smoldering hostilities on the bench, Breyer waved away that notion, saying Scalia just has a writer’s irresistible love for a good turn of phrase. “We all know that. We don’t mind. … That’s not a good reason to get angry at somebody personally if you’re sitting in my seat,” he said. A former professor at both HKS and Harvard Law School (HLS) between 1967 and 1994 before his nomination to the Supreme Court by President Bill Clinton in 1994, Breyer was at Harvard to discuss his new book, “The Court and the World: American Law and the New Global Realities,” with David Gergen, public service professor of public leadership and co-director of the Center for Public Leadership at HKS, and Nancy Gertner, a former U.S. District Court judge in Massachusetts and now a senior lecturer at HLS. Breyer’s book examines how U.S. courts should respond to the new reality of interdependence that globalization has ushered into areas previously thought to be immune, like the law. He encourages judges to become more attuned to legal thinking outside the country and to be more considerate both of the implications of American legal decisions on foreign nations in areas like national security and trade, and of how such international experiences might inform better American legal decisions. But unlike Europe, which has much more homogenous roots that can withstand a more narrowly tailored legal view, this “experiment” known as American democracy is best protected by drawing from a far wider scope of ideas, Breyer argued. Asked about his dissent in the Citizens United campaign-funding case, Breyer said the case was far tougher “than people give it credit for.” With no constitutional limit on free speech in politics, the case centered on what should be done about the average person who can only give a modest sum like $20 competing with those who can give $20 million for the attention of politicians and believing that the giver of $20 million will have more influence. Asked by Gertner about his role in helping to set judicial sentencing guidelines in the 1980s, standards that have come under fire for being overly harsh and unfair, particularly to African-Americans, and that are now being reconsidered by Congress, Breyer defended the sentencing commission’s original intent, which was to close what had been a troubling variation between sentences handed down and the individual whims of judges. The guidelines were supposed to be just that, he said, not hard-and-fast rules that deliberately limited a judge’s discretion. But decades later, there’s rare bipartisan agreement that the guidelines created more problems than they solved. When a student asked whether there’s tension between the individual identity of the justices and their deliberations on cases, Breyer was characteristically even-handed. “I would say no in the sense that whether you are a Latina, whether you are a woman, whether you are an African-American [or] whatever, you have a case in front of you, and these are judges, and they’re going to try to get that case right. So, it’s in that sense, no,” he said. Former World Anti-Doping Agency President Richard W. Pound (pictured), co-author of a report on the use of performance-enhancing drugs, said the current doping in Russia was “the tip of the iceberg." Pound presented the findings at a press conference in Geneva, Switzerland, on Monday.